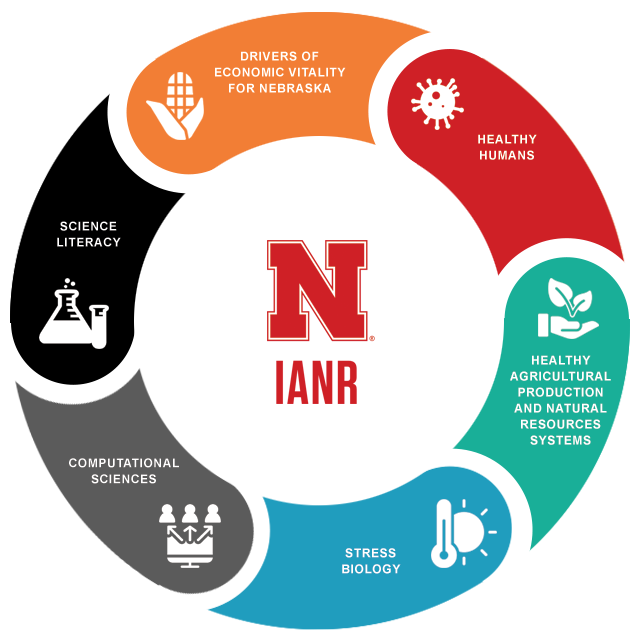 IANR strives to combine research, teaching and extension in a multidisciplinary, collaborative environment that encourages the best thinking and expertise from across the University and private enterprise – to ensure Nebraska’s competitiveness in a world of change and challenge. The six communities were formed in 2011. At that time, faculty from all IANR departments came together and rather than focus on individual department needs, they agreed to focus on areas of strength that they felt the institution as a whole could build upon. That type of bold collaboration and thinking is what was needed to propel Nebraska forward. We are striving to excel in these areas but we can go much further and have a much greater impact with your involvement. As we continue to strategize around these areas, we encourage you to become a part of the conversation. We welcome your feedback, ideas, engagement, and support in our ongoing endeavor to make your university a global leader in these key areas. IANR Faculty and Staff are welcome to participate in upcoming community meetings. Encouraging members of society to analyze complex challenges and make science-informed decisions in real-world situations. Improving production, health, and well-being for animal, plant, and human systems; we are working to better understand how organisms and systems adapt to stressors such as drought, insects, heat and cold. Establishing a research-based understanding to advance human health in relationship to healthy communities; we are conducting studies along a continuum from basic biomedical research directed to understand disease to nutritional foods and strategies that promote physical and mental well-being. Building on our expertise in soil health, water resources, ecology, risk analysis, and plant and animal systems, we are helping Nebraskans develop resilient agricultural production and natural resources systems. Striving to efficiently and effectively analyze and report large sets of high-quality data in ways that we can easily share with the public. Strengthening Nebraska's entrepreneurial approaches to stimulate economic development and increase the vitality of Nebraska's communities and the quality of life of its people.